Photographer unknown, Ben Maxwell Collection. 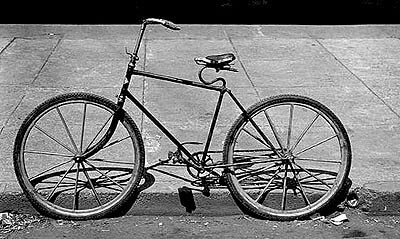 1899 Max Buren's "safety bicycle" as still life on a Salem street. 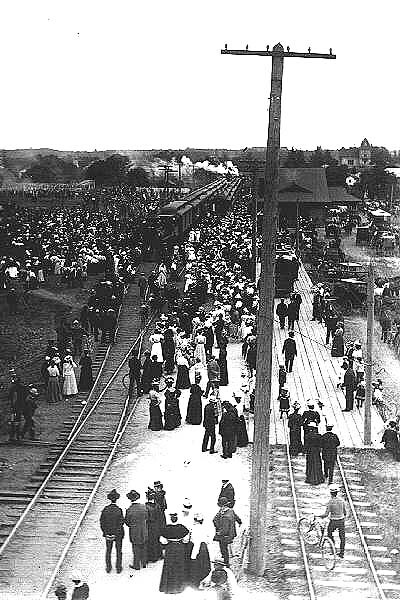 Aug. 10, 1899 A large crowd has gathered at the Salem station to welcome the returning Oregon 2nd Volunteers home from the Spanish-American War. The view, taken from the water tower, gives an interesting perspective of the early layout at Salem. Note the street car to the right and the stub switch on the mainline in the foreground. The area to the left was later occupied by a hop warehouse, and then the California Packing Company cannery. Today the Tokyo International University campus fills that area. 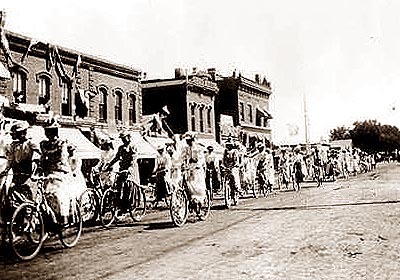 Sept. 19, 1899 Ladies of Greely, Colorado decorated their bicycles with American flags and bunting and paraded down Eighth Street to welcome the men of Company D home from service in Manila during the Spanish-American War. 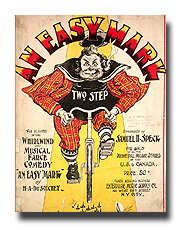 An Easy Mark was the title song of a musical farce by H.A. Du Souchet, presented in New York in 1899. Small boys, enterprising bicycle shop repairmen and cycling foes were known to scatter tacks along roadways for a variety of reasons. 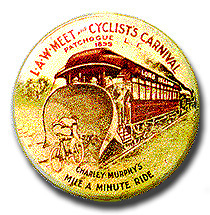 June 30, 1899 Mile-A-Minute Charley Murphy earned his nickname by becoming the first man to pedal 60 miles per hour on a bicycle behind a special Long Island Rail Road train. Capitalizing on its proximity to New York City, bicycle clubs and services mushroomed across Long Island. In 1897, the Long Island Rail Road ordered six baggage cars specially rigged to transport bicycles. In 1898, the LIRR published a pamphlet called Cyclists' Paradise, with maps of Island cycling paths. Long Island's Newsday produced an extensive history of the region, presenting the online resource at LI History.com. Read Charley Murphy's first-hand account. The Paumonok Bicycling Advocacy celebrated the hundredth anniversary of the feat and is promoting extensive new bike plans for the island. It wasn't until June 15, 1903, at Indianapolis, that Barney Oldfield, the legendary auto racer and chief mechanic for Henry Ford's racing team, became the first to achieve mile-a-minute performance in an automobile with a time of 59.6 seconds. In August 1903 he drove five miles in 4 minutes 55 seconds. 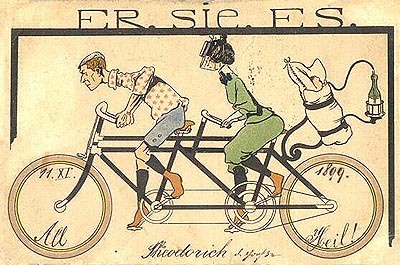 Oldfield began racing bicycles in 1894 and joined Ford in 1902. The quest for speed is a natural part of the human condition. 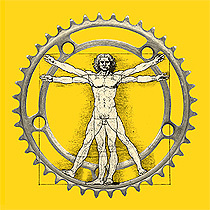 The International Human Powered Vehicle Association is the governing body for pedal power on land, at sea and in the air. The Ultra-Marathon Cycling Association tracks coast-to-coast records, 12- and 24-hour records and promotes distance events such as the Race Across America from Portland, Oregon to Gulf Breeze, Florida. Team Vail, winners of the 1998 Eco-Challenge, covered 2,983.2 miles, climbing 99,610 feet in 6 days 1 hour 17 minutes to win the 2001 race. John Howard was first person to go over 150 miles an hour on a bicycle when he established a new bicycle speed record of 152.284 mph on Utah's Bonneville Salt Flats in 1985. The seemingly impossible speed record only held 11 years until Fred Rompelberg established the current speed record of 166.944 mph on October 3, 1995.